The McLaren 650S is barely on the market, but that doesn't mean they couldn't roll out an upgrade just ahead of the supercar's Chinese tour. Meet the MSP 650S Concept. If you're not loaded enough to get a P1 but want more exclusivity than the common 650S buyer, McLaren Special Operations is here for you. 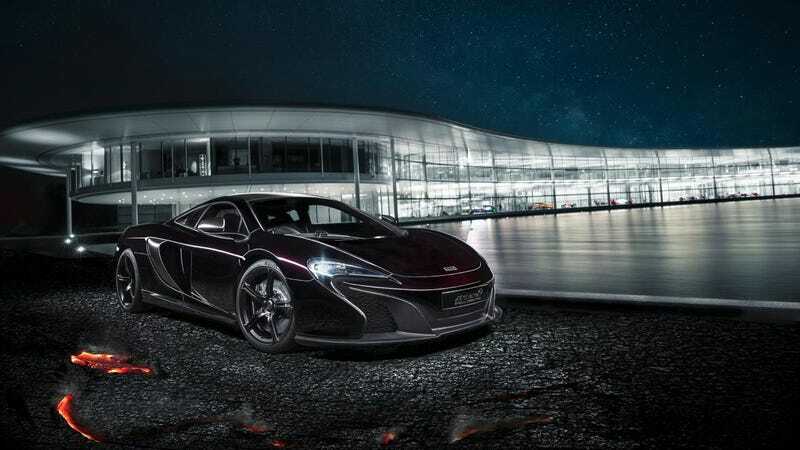 I guess the Photoshop bomb had to land for this press release, because the MSO 650S is really not much different from the base car other than a bit of carbon fiber here and there, but the good news is that the upgrades can also be fitted to the now deceased 12C. Basically, they made the concept car black as death, except it looks purple as death due to McLaren's 'Agrigan Black' finish, which is a metallic black paint with a deep ruby red metallic flake. It puts up quite a show depending on how much sunlight hits it. There are bespoke MSO carbon fibre side blades and a larger, GT3-style rear diffuser. You only need to spend $8,614 and $12,204 to get them. Good value airflow improvements right there. The engine cover and all other carbon fiber parts in the engine bay got a satin finish, just like the new wheels. Inside, fixed-back carbon fiber racing seats push it further to P1 territory, finished in carbon black leather instead of Alcantara but still saving about 33 pounds. All carbon bits get the satin finish inside as well, further enhanced by the switchgear and bezels that are contrasting gloss black. For now, the MSO 650S Coupe Concept is presented as a one-off design study, with only the side blades and rear diffuser becoming available straight away. Still, if you want this exact specification for your 650S, just ring up McLaren Special Operations. They can make things happen.